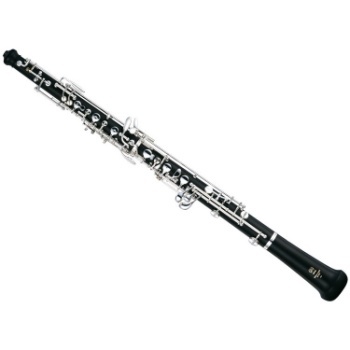 This is an economical ABS resin body oboe which features a simplified Conservatoire system, making it is easier to play for beginners. The surprisingly precise intonation permits students to concentrate more on developing their own musical nuances. But there is nothing 'student-like' about the rich and colorful sound. The 241 features a characteristically warm oboe tone which sounds very close to that of a professional instrument, so even a complete beginner will quickly develop a beautiful tone. NEWLY DESIGNED, HIGHLY POLISHED BORE: The new bore design which incorporates vertical integration is similar to that of the YOB-841 professional model. This results in improved projection and improved tonal qualities. NEWLY DESIGNED UNDERCUT TONE HOLE DESIGN: Also similar to the YOB-841, the new taper to the tone hole design provides the player with a smooth response and even intonation. NICKEL-SILVER BELL RING: The bell ring increases effective density of the bell for a quicker response and a more focused sound. FRENCH TAPER PIVOT SCREWS: French taper pivot screws are designed for precise adjustment and increased longevity. STAINLESS STEEL SPRINGS: Durability, key balance and a more comfortable feel are all benefits of using stainless steel as the spring material.